Acrylic desktop display case designed to hold 2 UFC Ultimate Fighting Championship official gloves. Each glove is held up by its own custom stand. Also available for a single glove by request. Desktop acrylic single boxing glove case for 1 glove. acrylic, all handcrafted and polished to a high luster. of your memorabilia collection. Price includes 1 free nameplate. vertical layout. Features a furniture grade wood frame. Price includes 1 free nameplate. Wall mount single boxing glove glass display case. Your choice of horizontal or vertical layout. Features a furniture grade wood frame. Inside measurements 12x8x8. 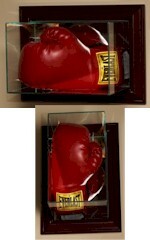 Our table top or wall mount boxing glove acrylic display case is beautifully designed and constructed. Looks great displayed on a tabletop or hanging on a wall. solution for an autographed boxing glove or other memorabilia (boxing glove pictured is not included). real UV protected glass and mirrored back. The base is also mirrored so you can see the entire glove. Glass display case designed to hold 1 or 2 boxing gloves. Featuring a furniture grade solid wood base real UV protected glass. The base and back are also mirrored so you can see the entire glove Interior dimensions are 14-1/2"L x 11"W x 11"H.
All glass display case designed to hold 1 boxing glove in a vertical position. with real UV protected glass. The base is also mirrored so you can see the entire glove. 8"L x 8"W x 15"H. Larger cases and custom cases for 2 or more boxing gloves are available. All glass display case designed to hold 1 boxing glove in a vertical position. Featuring a different furniture grade wood base and mirrored back panel with real UV protected glass. The base is also mirrored so you can see the entire glove. Interior dimensions are 8"L x 8"W x 15"H. Larger cases and custom cases for 2 or more boxing gloves are available. and mirrored back panel with real UV protected glass. The base is also mirrored so you can see the entire glove. Interior dimensions are 17"L x 8-1/2"W x 9"H. Larger cases and custom cases for 2 or more boxing gloves are available.